On Sunday, K, me and my family ventured out to Haspengouw, Belgium to go on an amazing walk through fields and fields of blooming fruit trees. I have a post full of pictures ready for Thursday, but I wanted to share my outfit for that day first as it’s been a while since my last outfit post. I went for a safe combination, that has proven it’s success on many blogs before. You can’t go wrong with some kind of black and white pattern on top and a bright colored bottom. For comfort I wore my trusty Teva sandals. So classy. I scored this cobalt blue skirt online in the Gap sales back in January, but only wore it for the first time this weekend. I absolutely love it. Bright blue hues, like cobalt, royal and electric are some of my favorite colors to wear, yet are barely present in my current wardrobe. I am still looking for that perfect cobalt dress to wear year-round. I spotted my dream dress in the Kate Spade Saturday collection, but it’s waaaay out of my price range so I’m checking my local Zara for a look-a-like more often than is good. I might bend soon though. I am weak when it come to pretty dresses. And my oh my, does Kate Spade know what girls like. Come back Thursday to see a little of all the beauty I got to enjoy this weekend. Hope your weeks are off to a good start! Great print mixing. I never really do that, though I really like how it looks. 🙂 Loving the blooms! One of my favorite print combos! I love that you picked simple black and white and added a pop of blue – it looks so cute for spring! Love that skirt! Great outfit Nikki! Leuke outfit. Haspengouw ziet er mooi uit, ik ben er zelf nog nooit niet geweest. Sounds like a great outing that you had! Polka dots and stripes. How fitting! Your dream dress is pretty and would suit you very well, but your skirt is already rather like it. How fun! I love the pop of color from your skirt! It's so pretty!! And I really like the mix of prints! I love Kate Spade but yes, it's way out of my price range too! Btw you chose such a great backdrop for your photo! Love the blossoms in the trees and the field of dandelions! Make some dandelion wine! I have a blue skirt just like that and no idea what to wear with it, besides a white t. Have any more ideas for it? This outfit is amazing! Loving it. p.s. the weather there looks gorgeous! Great photos! I can't wait to see the rest. You are so darling! Thanks for the kind comment on my invitations post. This outfit is perfect! Love how playful this is! Looks like gorgeous weather & scenery! I love cobalt + b&w so much & mixing patterns up to is too much fun! Love this pattern mixing! You look stunning. Can't really go wrong with polka dots and stripes… ever! 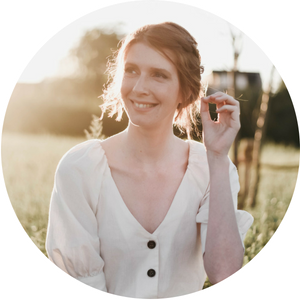 Mooie foto's, mooie outfits en zeker een hele mooie locatie ook! Die rok is leuk zeg! Mooooooie foto's Nikki! Erg leuk zo, die gemixte printjes 😉 ! Ik krijg altijd hartpijn van het zien van Kate Spade dingetjes 🙁 ZO mooi maar ZO duur 🙁 ! Lovely outfits. But you're always lovely, so there's no surprise in that. I adore this outfit!! It's so perfect for a spring day:) And I love the pattern play!! Such a cute outfit! 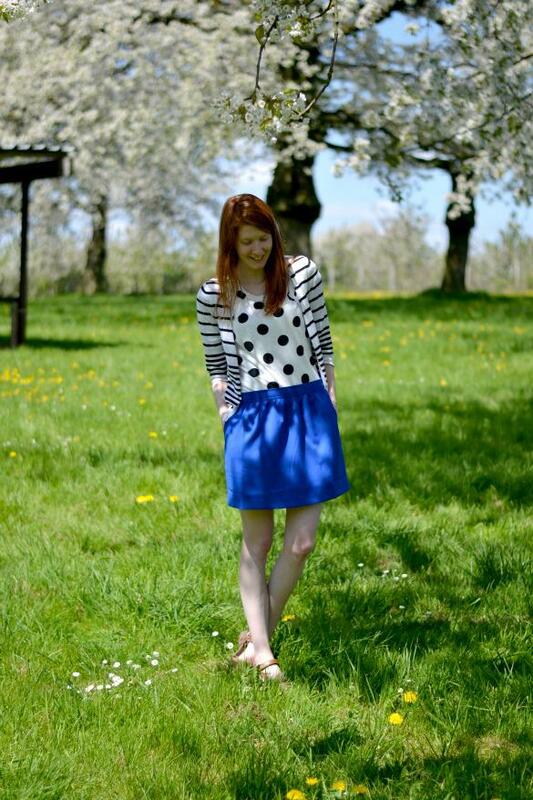 I like the stripes and polka dots together, and the bright blue skirt looks great with the black and white 🙂 Lovely location for photos too! very adorable, simple but so cute and the in the most perfect backdrop ever. 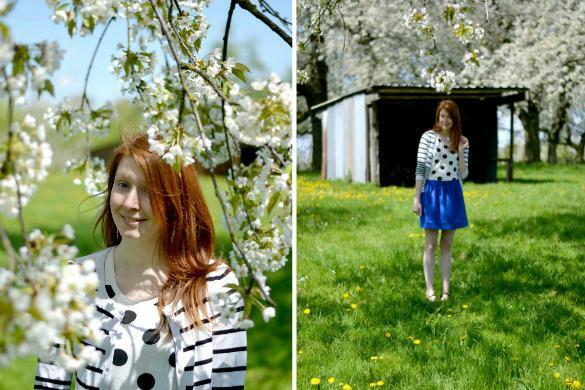 You look so adorable in these spring-y pictures! The print mixing in your outfit is wonderful! 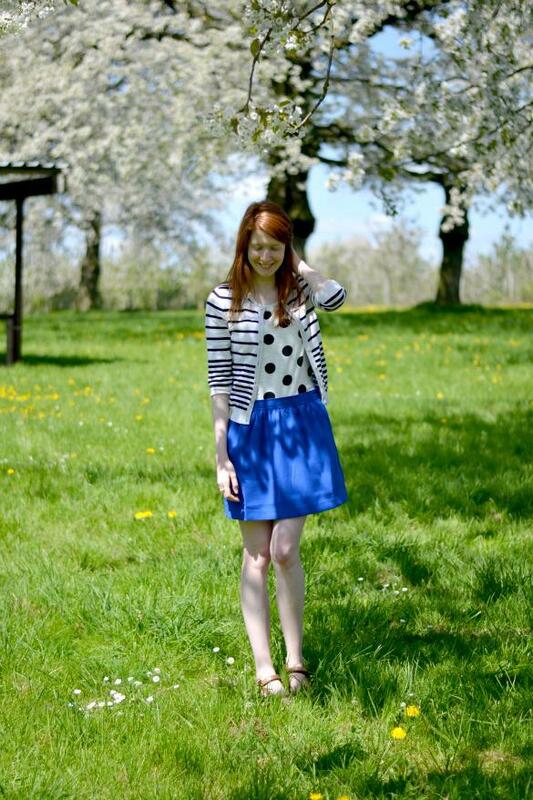 polka dots, stripes and cobalt blue! LOVE IT!